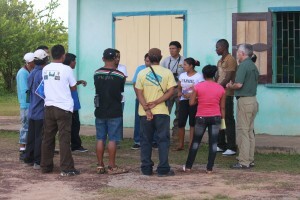 The group of guides and instructor Chuck Lennox at the Bina Hill Institute, North Rupununi, Guyana. North Rupununi, GUYANA – The Guyana Sustainable Tourism Initiative (GSTI) recently completed Phase II of the Guyana Interpretive Guide Training and Field Guide Development Program. The entire initiative encompassed nearly three weeks of training that reached 23 tour guides and 15 owners, managers and leaders from tourism operations throughout Guyana. The GSTI, a joint project of the United States Agency for International Development/ Guyana Trade and Investment Support (USAID/GTIS) Project and the Guyana Tourism Authority (GTA) sponsored and organized the training program. Chuck Lennox, Principal of Cascade Interpretive Consulting LLC, was the lead trainer. The USAID/GTIS Project and Mr. Lennox also worked with the GTA and the National Parks Commission to train 12 additional guides at Kaieteur National Park. With 25 years of professional experience in developing quality interpretive, education and training programs Lennox has worked in numerous destinations and with countless guides over his career, but he says few experiences compare to Guyana. Iwokrama International Centre tour guide, Alex Honorio explaining a weather station during of a mock interpretive tour. Phase I of the Guide Training took place from July 2-15 and focused on the knowledge and skills necessary for guiding interpretive programs and tours. 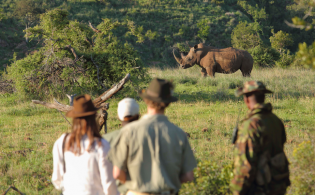 Course topics included: interpretation, communication and guiding skills; risk management and safety; host and customer service training; group management principles; and naturalist skills. Participants reported that the training allowed them to better understand, identify and interpret their culture and history, and the wildlife, birds, geology, plants and climate of their home sites. Phase II occurred from October 3-7 and involved two main segments: two days of follow-up guide training for the guides that participated in Phase I and one-day of field guide development training for guides and representatives from tourism organizations and community tourism projects throughout Guyana. The guide training sessions allowed guides to report on their recent experiences guiding visitors and to ask any questions that may have come up in the field. The guides also discussed the different ways that they were able to share and teach the training information with other guides and staff at their home site. 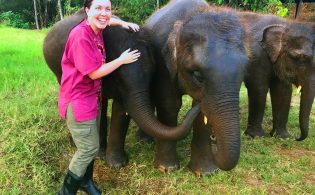 The training also involved several mock tours led by each guide and sessions on guide challenges, non-verbal communication, organizing interpretive programs and an overview of experiential tourism. The guides also provided feedback on the Guyana Tour Guides group that was set up on Facebook as a networking tool for all guides in Guyana. All participants received a DVD that contains a complete package of course materials from the guide training course. Information on the disc includes a detailed agenda of Phase I and II of the training course (information covered on each day, any related handouts and/or PowerPoint presentations, photographs and notes), field guide samples and several digital resources. 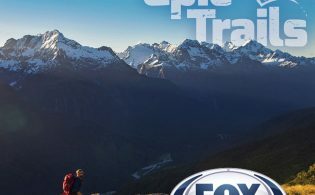 The DVD will allow guides, lodge owners and tourism leaders to plan and conduct training programs for their staff. The related field guide development training was held first in Georgetown and then repeated at Bina Hill in the North Rupununi. The training provided information and advice on how tourism operations can create a site-specific field guide that is a visual record of valuable local resources and a structured interpretation piece for visitors. The course also taught how to format a Word template into a booklet that can be printed or uploaded onto websites. The GSTI will provide follow-up assistance in the form of proofreading, editing, layout and design work and general feedback on field guides that are currently being developed by tourism sites in Guyana. The USAID/GTIS Project also assisted the Guyana Tourism Authority and the National Parks Commission with facilitating an interpretive guide training program at Kaieteur National Park, home of Guyana’s most popular tourism attraction, Kaieteur Falls. Chuck Lennox also instructed the three-day guide training for Kaieteur National Park’s four staff guides and eight new guides from nearby Amerindian villages. The training took place from October 9-11 on the top of Kaieteur Falls. In total, the guide training programs taught 35 tour guides the skills needed to better welcome, host and lead visitors around Guyana. To further maximize the reach of the training, all participating guides have agreed to use their new skills and knowledge to train fellow guides in Guyana. 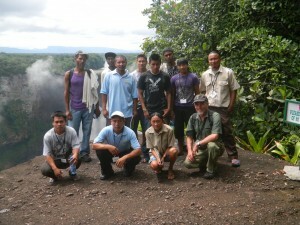 The group of guides (and instructor Chuck Lennox) that received training at Kaieteur National Park. The Guyana Sustainable Tourism Initiative is part of the Guyana Trade and Investment Support (GTIS), a joint project of the Government of Guyana and USAID. To learn more about tourism in Guyana visit www.guyana.travel, www.guyana-tourism.com and www.guyanabirding.com.